Every so often we will see a company declare a “special dividend” which is separate from the typical recurring dividend cycle, if there is one. It is frequently a reflection of exceptionally strong earnings and/or a company with a large cash balance. It is a positive sign regarding the financial health of this corporation. Some of you may remember the $3, 1-time cash dividend announced by Microsoft in 2004 to “relieve its balance sheet of a large cash balance”…such problems we should all have! When a stock generates a special cash dividend, let’s say $1 per share, the price of the stock is then adjusted by decreasing by that amount. This adjustment will take place the day AFTER the dividend is distributed. Now I can see the wheels turning in your heads…I’ll buy the stock on the record date and sell it before the price adjusts for this distribution…I’m going to make out like a bandit! Not so fast…don’t quit your day job. The earliest you can sell your stock and still be entitled to the special cash dividend is the date the stock begins trading on an “ex-distribution basis”, or one day after the dividend date. Oh well. Now let’s bring this information into our world of covered call writing. 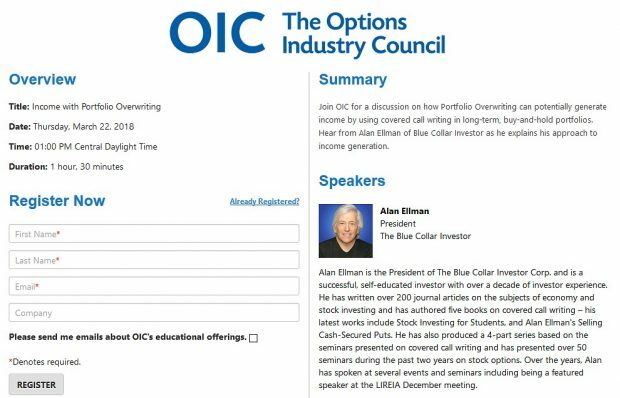 We sell call options which implies that someone is buying them (we’re the “casino” …they’re the players). Let’s say we buy a stock for $69 and sell the $70 call. The holder of that call option bought the call with the strike $1 higher than the market value of the stock. If a $1 cash dividend is distributed prior to expiration causing the stock price to be adjusted down by $1 his position would be dramatically compromised. To make this situation fair and the option buyer “whole” the strike price is decreased by the dividend amount or $1 in this scenario. So a $70 call becomes a $69 call. All other factors being equal, the market value and strike drops an equal amount and so the strike is still $1 from the market value. These calculations are NOT for tax purposes. They are used to assess the best covered call decisions at that specific point in time. The OCC Security Committee evaluates each situation on a case-by-case basis but generally speaking if a dividend if greater than 12 1/2 cents the strike price can be adjusted by the amount of the dividend. If HFC had declared a 1-time cash dividend of $1.25, the $70 strike would become $68.75. As new series of options are published, the standard strike prices will return. Special cash dividends will frequently impact our strike prices due to the decrease in share value after the distribution. Because these are handled on a case-by-case basis it is important to understand how your position has changed due to the unexpected cash or stock distribution. The websites I referenced above are great resources for locating this information as are specialists who work at your brokerage. Editing has been completed and just needs my final approval. This is a general stock and mutual fund investment book geared to high school and college age students. It is the book I’ve always wanted to write. I anticipate publication this summer and I will make the book available to our members at an early discounted price before it is available on Amazon.com. For the week, the S&P 500 declined by 0.1% for a year-to-date return of 16%, including dividends. The Weekly Report for 06-14-13 has been uploaded to the Premium Member website and is available for download. I’m curious how often these 1 time special dividends appear with the stocks on our premium list? These events will come up rarely, perhaps 5-6 times per year. However, I feel that it is important to understand why “unusual” quotes may appear in our options chains and why. Other situations that will impact these quotes includes mergers, acquisitions and stock splits. I’m planning to attend your seminars in San Francisco. Is the material you will cover the same in both presentations or should I plan on coming to both sessions? The sessions will be different. The morning seminar will be an overview of cc writing describing the basic principles and areas to master. The 6PM presentation will be more specific with examples. Please introduce yourself to me. I bought the stock at ninety. Its now ninety dollars and fifty cents. I don\’t want the stock to be called away. If Ron repurchases the option , he is going to pay more for it than the price at which he sold it and that\’s because the stock has gone from ninety dollars to ninety dollars and fifty cents. If he likes the stock, he could let it be called away and immediately buy it back. If it was me, I would simply let the stock be called away, pocket the premium I got when I sold the option, and repurchase the stock at its current price ( which is higher than the price he paid for his first purchase of that same stock. In your question I’m making the assumption you are making this decision on or near expiration Friday and you want to retain the stock for purposes of cc writing. In that scenario it almost always pays to buy back the option and sell the next months option (“roll the option”) rather than allow assignment and re-purchase the shares and then sell the new option. The reason is that the time value of the near-month option is approaching zero (it will be a few pennies) and usually less than the additional commission you will incur by allowing assignment and re-establishing your entire position. Generally speaking, if you have determined that by rolling the option prior to expiration the returns meet your goals and the “deal” is there, TAKE THE DEAL. The stats can change the following Monday. Iconix Brand (owner of London Fog, Danskin, Sharper Image and many others) reported a stellar 1st quarter earnings report on April 24th. Earnings beat consensus by 6% for the 4th consecutive earnings “beat” Analysts are projecting an earnings increase of 28% in 2013 and another 9% in 2014. It trades at a fairly valued forward PE of 13.9 below the market average of 15. It also trades at an impressive price/book ratio of 1.5 (3.0 is considered value). Our premium stock list shows an industry rank of “B” and a beta of 0.92.